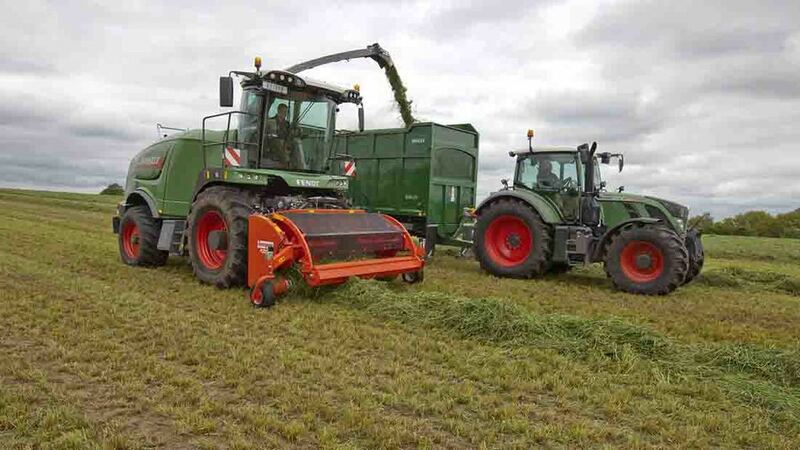 Has Fendt forager buying gamble paid off? Is Fendt’s Katana 65 good enough to rattle the old guard? After a successful first season, Gloucestershire contractors James Biddlecombe and Brian Morris believe so. Geoff Ashcroft reports. Fendt's Katana 65 packs 650hp from a Mercedes V8 engine. A long-standing relationship with Mill Engineers and Claas foragers ended in 2015 for Gloucestershire contractors James Biddlecombe and Brian Morris, when the duo took delivery of a Fendt Katana 65 for their general contracting business. So was it madness to leave the safety and security of a comfortable pair of old boots in favour of what some might view as a fancy pair of shoes? 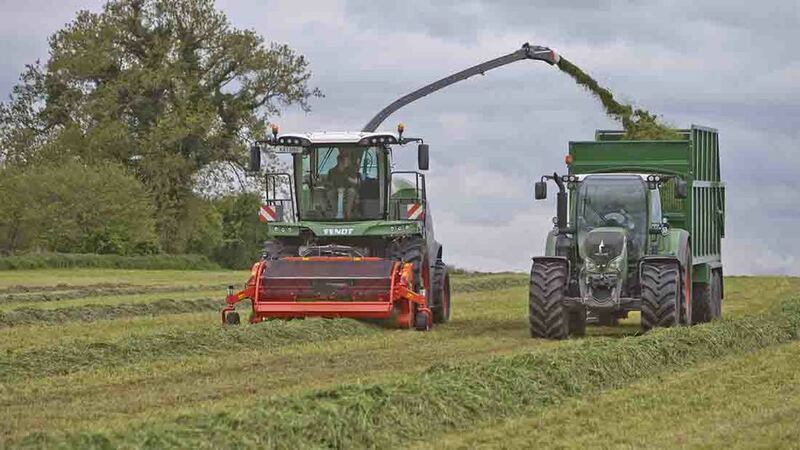 “Far from it,” says James Biddlecombe, who spends his silage season at the helm of the forager. Reflecting on the Katana’s first full season of grass, whole crop and maize, he believes the arrival of the Bavarian firm’s forager was a well-considered and thoroughly thought out decision. Gloucestershire contractors James Biddlecombe and Brian Morris are pleased with the performance and efficiency of their Fendt forager. “We’ve brought more efficiency to the business, with greater output and lower fuel consumption, while improving forage quality for our customers,” he adds. The forager buying process started during the 2014 maize harvest, when the pair put contenders from Krone, New Holland, Fendt and Claas through their paces while seeking a suitable replacement for their 2009 Claas Jaguar 950. A workload comprising 1,011ha (2,500 acres) of grass, 800ha (1,980 acres) of maize and a fluctuating area of whole crop meant more power would be useful, but it was not essential. Cab offers a panoramic vantage point from its spacious, uncluttered interior. Four-wheel drive and rear axle suspension is standard, which he says is superb, as is Fendt’s V-cracker disc rollers for maize. He says that performance in maize is 8 ha/day (19.8 acres/day) higher, with the Fendt comfortably seeing off 40ha/day (99 acres/day). “Not all our output is from having a bit more power,” he says. “Crop flows through the Katana very well, and its six feed rollers present a consistent wedge of crop to the chopping cylinder,” he says. 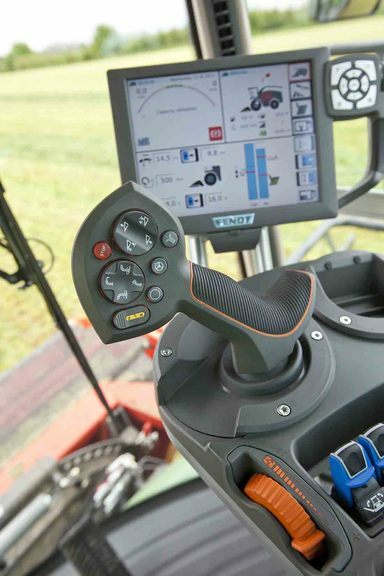 Katana’s joystick moves and operates in the same format as the Fendt tractor joystick. 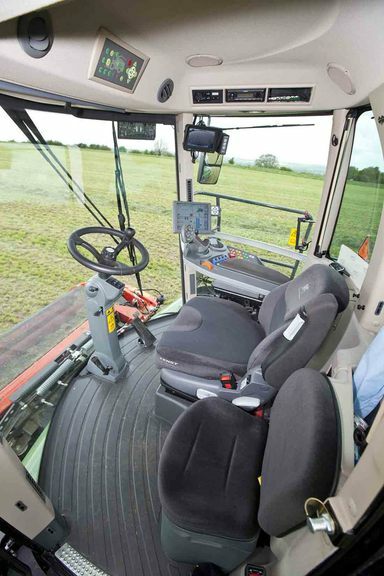 “And with hydraulic drives for the feed rollers and pickup, I can tweak crop flow to get the best from the forager, or make the most of the auto speed adjust function,” he says. Grass output, at 60ha/day (148 acres/day), is marginally better than his previous forager, but in all crops, he adds that chopping accuracy from the Katana has never been so good. “It’s almost too good, and we’ll probably consider removing some of the knives this season to give customers a more varied chop length,” he adds. When it comes to chop length, customer preference is for 22mm in grass and 14-16mm in maize. Blade life for the Katana’s 28-knife V-configuration drum is a full season in grass and maize blades will see off two seasons. “And our best maize day saw 2,800 tonnes of crop harvested,” he adds. But the road to higher efficiency isn’t paved entirely with gold and the first season hasn’t been entirely fault-free. 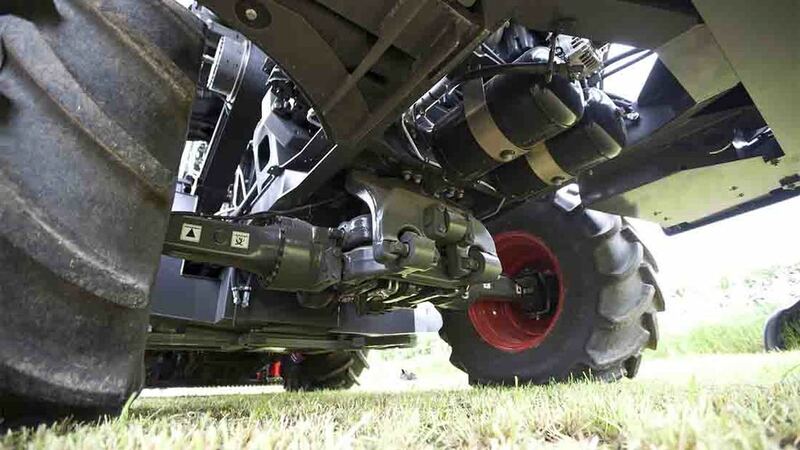 Rear axle suspension boosts ride comfort and is fitted as standard. He adds that the dealer and Fendt have been more than up to the task of resolving problems, and thicker, stronger tines have been fitted to the pickup for the 2016 season. With almost 600 hours under its belt and its first season completed, Mr Biddlecombe is pleased with forager performance. “So far, I’m pleased with what the Katana has brought to the business,” says Mr Biddlecombe.